As a horse ages its lifestyle must change to fit its needs. This may include altering their diet, seeking more frequent veterinary care/management, addition of new supplements and/or medications, and more. 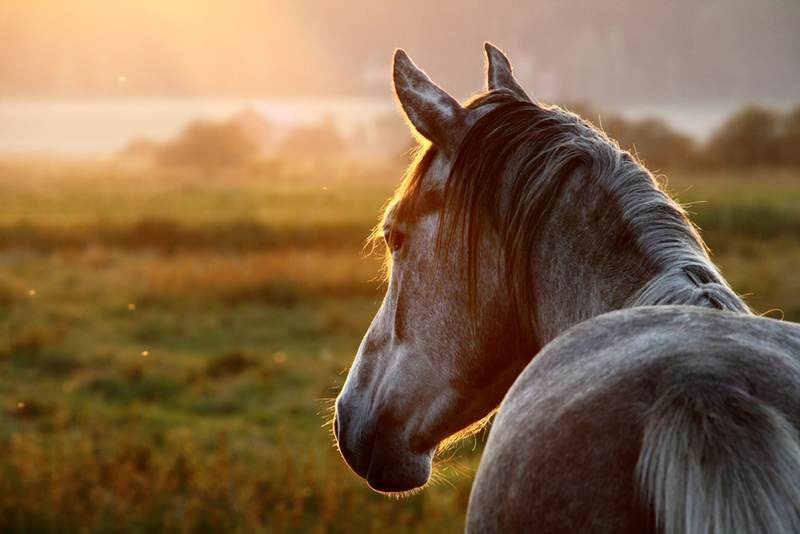 As owners, it is our responsibility to ensure we adapt our senior horse's lifestyle to properly fulfill its needs so that it may live the remainder of its senior years happy and healthy. "When is my horse considered 'Senior'?" A senior horse is also known as a geriatric horse. The age at which a horse is deemed geriatric depends upon the breed- draft horses tend to age faster then their smaller counterparts. There is, however, no definitive chronological age at which a horse is considered geriatric. A more effective way of determining senior status in a horse is taking into account its chronological age (year from birth to current age) and its physical condition. Some Common Physiological Problems in the Geriatric Horse include: Arthritis, Anemia, Decreased digestibility, Decreased intestinal mobility, Equine Metabolic Syndrome (including insulin resistance and laminitis), Cushing's Disease, various tumors that become more prevalent with aging, and more. Owner should work closely with their veterinarian to discover a dietary plan that specifically meets the nutritional needs of your geriatric horse. Some changes may include increase in daily caloric intake, daily energy intake (soluble carbohydrates/fats/oils), and daily protein intake. It is important to supplement necessary vitamins and minerals, however, mega doses of vitamins and excessive calcium intake should be avoided. Digestibility decreases with age, therefore, feeds need to be easily digestible. Stay away from non-digestible fibers and keep percent of daily fibers below 30%. It is best to provide 2-3 small meal throughout the day rather than one large meal to aid in digestion. Forages: Forages and long-stem hay should be the foundation for all horse diets. Quality alfalfa or quality grass hay are good choices to feed the geriatric horse. Alfalfa is high in calcium and protein- one of the advantages of feeding it to senior horses, however, excessive calcium can be detrimental to a horse's health. It is best to feed half alfalfa and half grass hay to avoid overfeeding of alfalfa. Forage Alternative for Seniors with Dental Problems: Hay cubes, pelleted forage, and chopped forage are all alternatives to long-stem forage. Beet pulp is a good alternative to hay, which can be hard to chew for horses with dental issues, however, just like alfalfa it is high in calcium and should not be feed in high amounts to avoid over-intake of calcium. "Complete" feeds are high in fiber and in theory can be fed with feeding supplementation. Many commercial feeds labeled for senior horses are considered "complete". Commercial Feeds: Senior horses should be fed a select food labeled for seniors or geriatric horses. These feeds are more palatable and easier to digest. They also are softer and easier to chew, which is important since the risk of choking increases with age. Pelleted and extruded feeds can be made into mashes for horses with severe dental problems or missing teeth they need to chew. Mashes are feed mixed with water to make it into a soupy consistency- this improves feed intake and increases daily water intake as well. Supplements and Additives- Feeds or supplements that contain yeast cultures, probiotics, or prebiotics can aid in digestion. Vitamin C supplementation can boost the immune system. Additives that contain fat can improve hair coat appearance and help maintain body condition. Geriatric horses should have annual visits with their veterinarian for- dental exams/work, monitoring body condition, thorough examination, regular hoof care, and preventative care, such as vaccinations and blood work. Ensure you are keeping his weight at a healthy range. A helpful tip is to take a picture from the same angle every 4-6 weeks and compare them to ensure it is not losing or gaining too much weight. Do not allow the horse to become too thin or too fat- it is harder for geriatric horses to gain weight or lose weight once it happens. Provide appropriate exercise and ensure you warm up before strenuous exercise and cool down afterward. If your geriatric horse is having issues with vision consider using fencing that is highly visible- thick wooden fences, or some material similar. Also, remove large rocks and fill in holes they could step in. Geriatric horses should not be kept in pastures with an open water source they could fall into. Instead, they should be provided with fresh, clean water in a large livestock watering trough 24/7. ALWAYS discuss concerns you have about your horse with your veterinarian immediately. "My horse is having trouble getting around." Answer- Your horse could be suffering from arthritis, or another mobility issue that your veterinarian could diagnose. There are medications available to help treat inflammation and provide pain relief. Make an appointment with your veterinarian to discuss this issue. "My horse is dropping his feed and losing weight." Answer- Your horse's feces should be tested for worms and their teeth should be examined. Sharp points on teeth can cause a horse to drop feed as it hurts to chew. Internal parasites will cause a horse to lose weight quickly. They should be tested instead of just given dewormer so that unnecessary ingestion of dewormer is avoided as it can be harsh on their stomachs. "My horse is running into things in the pasture." Answer- Take your horse to the veterinarian for an eye exam immediately. Some conditions can be corrected and visibility can be at least partially returned if caught and treated quickly. Thanks for explaining such complex information! I never heard about "geriatric horse" term before. By the way, take a look on www.boomsessays.com/write-my-paper.html this website. See you!